These are figures from a variety of sources that are to some extent left over. Craig gave me some of my own figures that I’d given him a long time ago. They were for a WRG 5th edition Welsh army that I started, and never really finished, in the early 80s. Before the days of the Internet the figures were bought blind. The Freikorp figures from Northern Ireland were the best, but I’ve not kept any. There were quite a few Peter Laing figures that were pretty ugly but got painted while I waited for the others to arrive—prompt delivery was there only virtue. They were compatible in general shape with the Freikorp figures, but neither mixed well with these Minifig figures that Craig was going to use for that Pre-feudal Scots army. They’ve not been used for much beyond garrisoning camps! I made an assortment of peasents from Donningtons into a DBA camp followers element. They’re not bad figures, but slightly taller than the Feudal Castings figures. 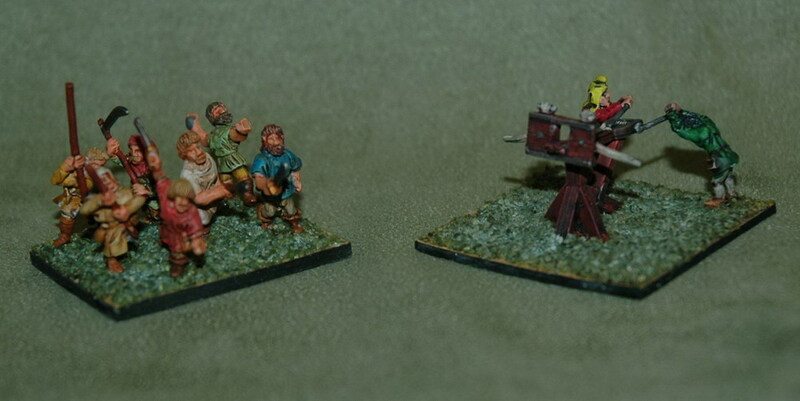 I also used a few of the Donningtons figures for a Galwegian warband element. I was used a lot as part of the Pre-feudal Scots army until I finally painted a second Feudal Castings warband. It’s now relegated to camp follower duty, if that. I got quite a few Museum figures from Eureka only to find they are substantially bigger than the Feudal Casting figures, which I’ve taken as my standard. I’ve painted the bolt shooter and a peasant horde, but have another 5 hordes as well as an element of crusader pilgrims (5Wb) waiting to be painted—it just doesn’t seem right that lowly horde figures should be taller than line figures. I may eventually use Essex figures for my peasant hordes; they scale OK with the Feudal Casting figures. I have used the horde once with the Norman figures to make a Papal Italian army.